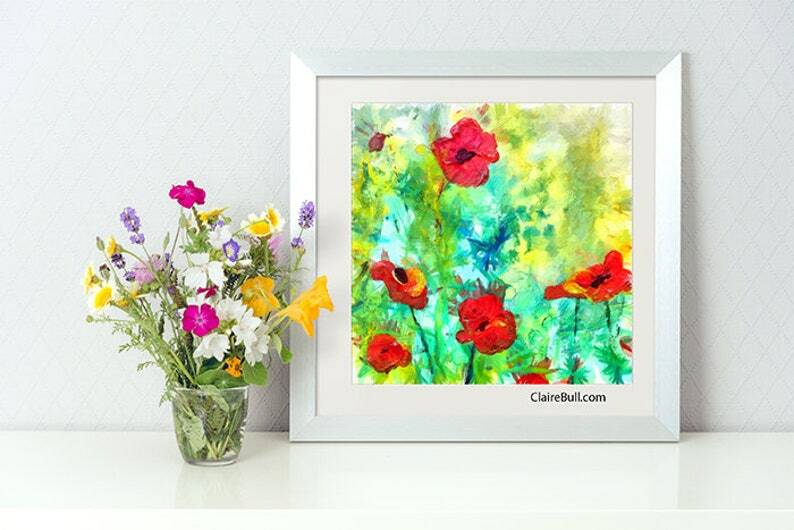 This colorful Poppies painting is called "Poppy Light" and was painted on canvas in acrylics and worked in Photoshop to present this art for you. Positive art for your home or office and great as a gift for gardeners, teachers, Mom, family and friends. Choose from archival fine art matte finish print or beautiful satin finish on premium heavy card stock. Printed on Archival 300 gsm heavyweight smooth matte paper with no glare. Printed on Premium 352 gsm heavyweight Satin finish card stock. Eco friendly 30% recycled Green Seal Certified white paper. Printed professionally with fade resistant inks for a premium quality art print at affordable cost. Shipped in cello sleeve and thick protective mailer. Also available in other sizes. Or as Canvas wall art in my listings (as shown in final image above). Mat and frame not included. Can be framed with a mat which will cover 1/4" of the art all around. Actual colors may slightly vary from those shown due to the nature of individual computer monitor settings. © Claire Bull / All copyright and reproduction rights reserved. Photos and Artwork may not be reproduced by any process without my permission. WATERMARK WILL NOT APPEAR ON YOUR PRINT. Thanks for your support of my work. This is a custom made item with my artwork, created when you order it. Once the order is placed, manufacturing begins and no cancellations or returns are accepted as each item is made to order. Images are as accurate as possible but monitors vary and each item is handmade so variations can occur. The items are all Canadian made with environmentally friendly products and methods of creation. Art meets Fashion through creativity and passion.